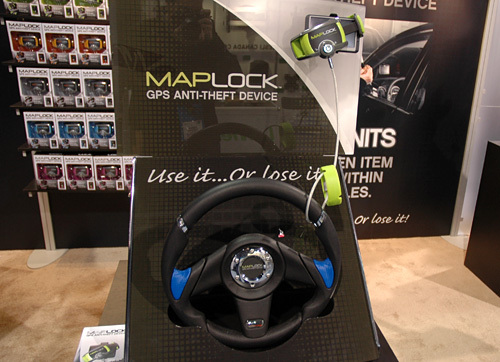 [CES 2010] Maplock GPS Anti-Theft Device | OhGizmo! GPS devices have definitely come down in price over the years, but they’re still not at the point where you wouldn’t care if one was stolen from your vehicle. So the Maplock ensures that when you leave your car with a GPS unit still attached to the windshield, it will still be there when you return. 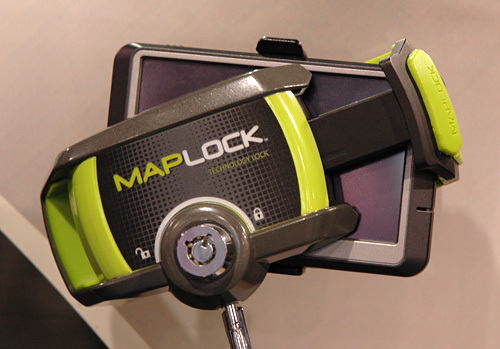 A locking, adjustable clamp that fits GPS units from 3.5-inches up to 5-inches in size attaches to the device itself, while a steel cable is looped through the steering wheel essentially tethering it to your car. Now it doesn’t 100% guarantee that your GPS in unstealable, but the bright colors also serve as a deterrent telling would-be thieves to swipe the unit from the next guy’s car instead. $49.99 available in April, though you can pre-order one from Amazon right now. Really? We need signs to tell us to do things like this? Do they need signs to remind people to lock their doors at night? or Set their alarms, or breathe… Like don't put plastic bags on your head, you might suffocate. GPS devices have definitely come down in price over the years.